Elder Scrolls Online dev Zenimax Online Studios says additional content is already in development. Zenimax Online Studios is taking The Elder Scrolls Online very seriously, and plans for it to stick around for a long time, promising up to five years worth of continued content updates. General Manager Matt Firor told VG24/7 that additional content for the game's five-year-plan is already in development. "At five hours the art needs to be good, it needs to feel good when you sit down. Five days is the levelling needs to be good, five months is the end-game needs to be good and the five years is the one you're talking about. That's the magic one, the one that's really 'community'. You're going back because you like the people you're playing with, it's also the hardest to achieve obviously." "You need to make sure there's something for those players to do that's new and refreshing on an ongoing basis." Firor explained, "So the other side of that is we're planning regular content updates and pretty substantial ones like every month to six weeks - we're working on the actual cadence just now - but we're already working on post-launch content now." Firor also explained how The Elder Scrolls Online can take the "massively multiplayer" out of MMORPG if players wish to do so, telling us that the core quest line - in which you try to reclaim your soul after it's been stolen by Molag Bal - can be completed alone. It's basically a new, full Elder Scrolls title with online aspects should you wish to use them. 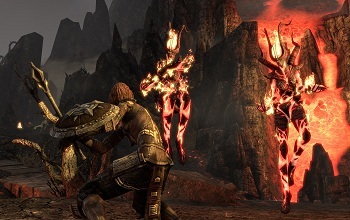 Recently, Firor justified The Elder Scrolls Online's subscription model, claiming that it wouldn't be a true "Elder Scrolls experience" if it was free-to-play.